Canon’s PowerShot G-series cameras need no introduction to enthusiasts; they’ve been instrumental in defining the ‘prosumer’ compact category since the introduction of the original G1 over a decade ago. 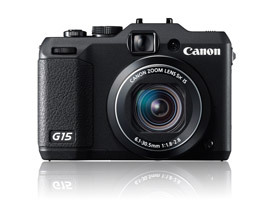 The PowerShot G15 is the latest iteration based around a ‘High Sensitivity’ 12-MP 1/1.7-inch type Canon CMOS sensor in combination with a new high-speed image-stabilized zoom lens, the equivalent to 28-140mm. As mirrorless cameras have impacted the sales/desireablity of high-end compacts, the G15 sees a return to the more compact dimensions of the earlier G7 and G9 models. Although it has a similar range of focal lengths to that found on the previous model, the G12 (and slightly wider range over the large sensor G1X variant) the G15 boasts a truly fast f/1.8-2.8 variable maximum aperture. Not only is this lens over stop faster (brighter), a real benefit for available light photography while permitting some extra degree of depth of field control, it has a complex optical construction including multiple asperhrical surfaces as well as single UD (Ultra low Dispersion) glass element. While aspherical elements are common, UD glass is usually reserved for the firm’s L-series lenses and should help reduce chromatic aberration. Elsewhere, the G15 continues to provide auto, semi-auto and full manual exposure control along with raw file option, an optical viewfinder, and a new larger 3-inch LCD (920k dot) PureColor II G (albeit now fixed instead of articulated). The G15 is the first in the series to feature a CMOS sensor and Digic 5 processor which boosts maximum ISO settings fourfold to ISO 12,800 and adds faster AF with face ID and tracking. Video shooters shouldn’t feel left out either. The G15 gains a new dedicated video-capture button to go with the vital 1080p (up from 720p) 24fps clips for today’s movie-making moguls. Moreover, all of this squeezed into a new smaller lighter and more pocket-friendly body. With a DxOMark sensor score of 46, the Canon PowerShot G15 actually (disappointingly) comes in behind its predecessor, the 10.1MP G12 (with its CCD based sensor), albeit by just one point. However coming 162nd in the overall DxOMark rankings, the raw sensor performance of the G15 fares a little better when viewed against last year’s rivals such as the Panasonic Lumix DMC LX5 and Nikon P7100, ranked 164th and 165th respectively. We’ve yet to assimilate the data for this year’s LX7 and P7700 models, but the G12’s higher 157th placement shows a slight hike in pixel count may be impacting Canon’s lead in sensor performance. We’ll have to wait and see. The Canon PowerShot G15 delivers no improvement in Low Light ISO at 165 over the G12’s 161. Individual scores of 19.9 Bits for Portrait (Color Depth) and 11.5 Evs for Landscape (Dynamic Range) are both considered to be good but are behind the best performers in this class, which are currently the older Canon PowerShot S100 and Fuji X10 (though it should be noted the Fuji sensor is a slightly larger format, albeit still <4:3). With their larger sensors and generally better low light performance small Micro Four Thirds cameras are muscling in on territory once dominated by high-end compacts. We don’t know if the G12 exceeded Canon’s expectations in terms of sales, but with its compact dimensions and improved low light capabilities (courtesy of the new lens) the somewhat smaller PowerShot G15 is certainly promising/enticing. The doubling of the maximum ISO to ISO6400 may also justify the new model for some, however there is very little actual gain over its predecessor’s low-light performance. The G15’s smaller size makes the decision to select it over a genuinely compact model such as the highly regarded PowerShot S100 even more tricky. As that model is becoming difficult to find it’s more relevant if we compare the sensor performance with the newer, recently reviewed S110 instead. Both the G15 and S110 share the same sensor but the G15 conceded 2 points less with overall DxOMark score, and it comes as little surprise that most of all ISO settings measurement are very close including the Low-Light ISO score of 168 (vs 165 for the G15). There are also only slight differences for low ISO settings including half-stop less in Color Depth and a third-stop more in Dynamic Range. Considering the S110 is smaller, lighter and cheaper with a 24-120mm f2.0-5.9 equivalent zoom, the G15 is facing stiff competition from its own sibling. As the G15 isn’t the only G-series model available now, for just $200 more you could indulge yourself and opt for the G1X. It has a much bigger sensor by area, slightly bigger than 4:3 at 18.7x14mm, a 28-112mm zoom, and 3-inch screen but the lens maximum aperture isn’t exactly fast at f/2.8-5.8 and it’s heavier while being nowhere near as compact. But we’re all about sensor performance here and the G15 scores 14 points less for the overall DxO Mark score, which means the G1X sensor is superior than that of the smaller unit in the G15. When compared directly, the G15 has one stop less in Color Depth and two stops less in Low Light ISO performance, meaning the smaller sensor in the G15 is hindered by it’s modest surface area, which isn’t really a surprise. When it comes to low light performance the G1X is streets ahead of the G15..
With full-manual control, 28-200mm f/2.8-5.6 stabilized zoom lens and 3-inch fold-out LCD, Nikon’s challenger to the G-series last year was the CoolPix P7100. Like the Canon it features a 1/1.7-inch type sensor (this time made by Sony) though bear in mind it has a slightly lower 10.1 MP resolution and it adopts CCD sensor technology (with the somewhat limited 720p spec video output). In our sensor tests, with 5 points more in the DxO Mark ratings the new CMOS chip in the Canon brings with it some qualitative gains over the CCD in the older P7100, however the two are still close. In summary then the G15 has one-third more in Color Depth, the same again in Dynamic Range and for all intents and purposes the same performance in our Low-Light ISO test. With the move from CCD to CMOS the signal-to-noise ratio for the G15 compared with the older Nikon P7100 shows a similar performance despite an increase in sensor resolution. The move from the conventional CCD to a CMOS sensor structure with its accompanying electronics in the latest G15 has bought with it some tangible gains in user benefits such as full HD (1080P) video and a doubling of the maximum ISO available. We can also see from our testing that while the pixel count has increased some 20-percent there has been only a marginal impact on sensor performance. This is a good result overall and when considering the G15’s other features such as the flexibility of the new high-speed zoom and reduction in size over previous iterations it’s a extremely well-balanced and attractive package. For consumers the choice remains whether to spend more on an equivalent micro four-thirds camera with a number of lenses to match the same kind of flexibility or whether to restrict that versatility somewhat by selecting a more compact model such as the S110. Alternatively, you could consider the G1X or Sony RX100, both offer superior low–light performance with only a small premium to pay in both size and price.